Dude, where’s my treehouse hotel? That’s not the title of a bad sequel to an Ashton Kutcher movie of a similar name. It’s what you might be saying to your room mate were you and he guests at The Treehotel in Harads, Sweden. 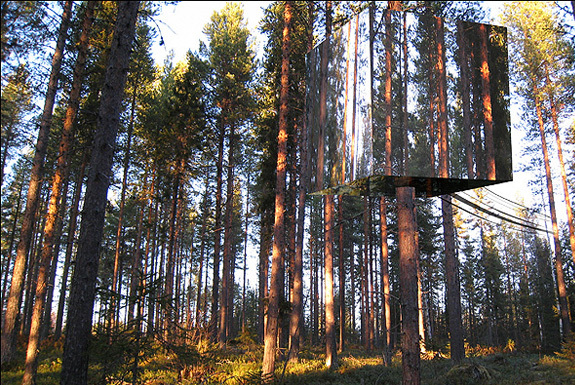 That’s because one of the accommodations options there, the Mirrorcube, is invisible! Or, at least nearly invisible. 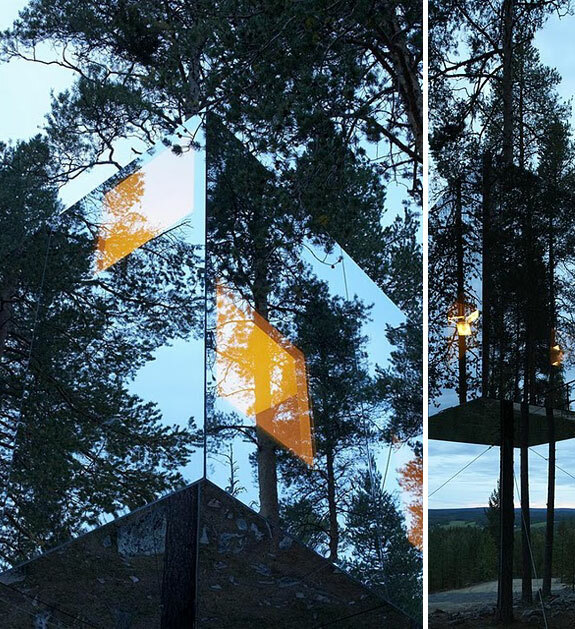 Designed by the Stockholm-based firm Tham & Videgård Arkitekter (creators of many a cool architectural concepts), the Mirrorcube features reflective external surfaces. 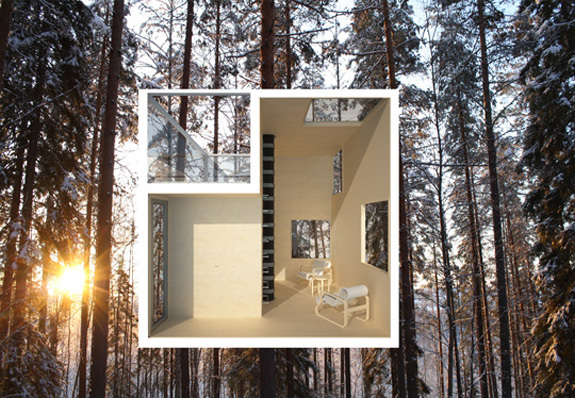 The smooth exterior of the cube-shaped structure is extremely difficult to detect in the middle of a thick forest—especially in the arctic rays of Lapland, northern Sweden, where the light can play tricks on your eyes even when there aren’t mirrored buildings about. The Mirrorcube is suspended above the ground on wires strung from four trees and is reached by way of a (thankfully visible) rope bridge. 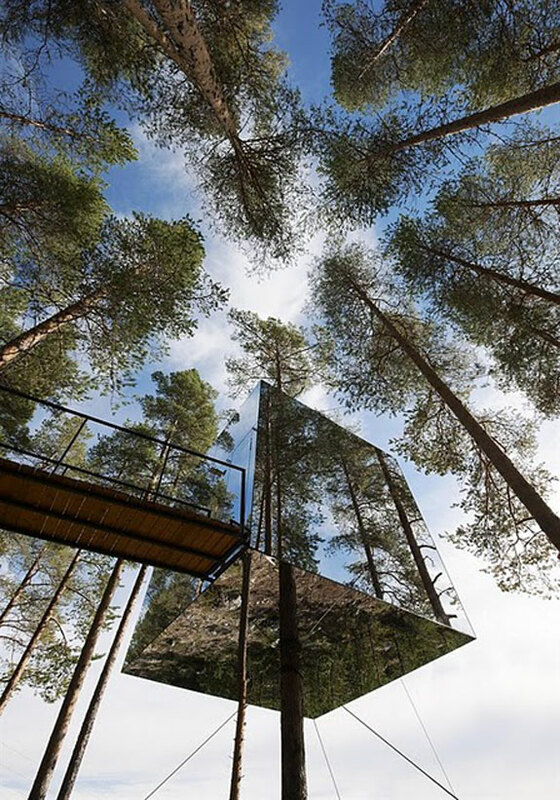 By the time the entire Treehotel complex is complete—it opened in the summer of 2010 and construction is ongoing—it will feature a second invisible-esque treehouse abode; it will be reached via a rope ladder (see artist rendition to the right). Once you find your invisible treehouse—or, we should say if you find your invisible treehouse—and make your way inside you my wonder where all the space has disappeared to. 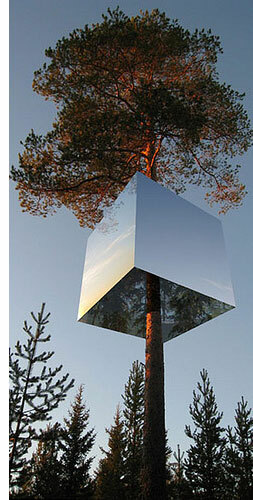 The interior of the Mirrorcube is only 16 sq. m (172 sq. ft.), though that’s enough for a kitchenette, queen bed, small bathroom and sitting area. The coolest feature may be the upper outdoor deck that offers views of the forest from a perch not visible from the ground. Imagine the fun you can have suddenly appearing to the people walking below à la Harry Potter throwing off his cloak of invisibility. • The Bird’s Nest – a living area that traverses three cedar trees. • The Blue Cone – a large windowed cabin (that’s red) on silts. 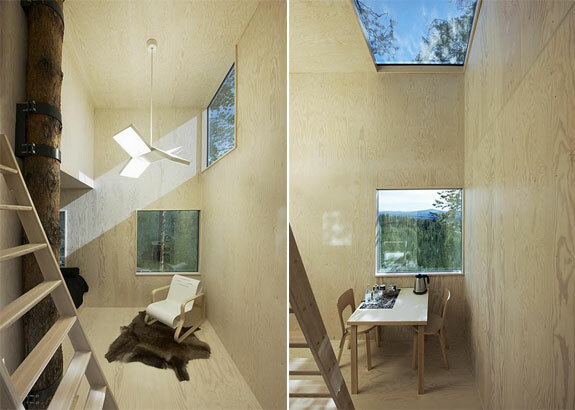 • The Cabin – a capsule perched up close to the tree canopy level. • The UFO – a shiny oval pod reached via trap door. A night at the Mirrorcube will set you back €475, an amount that will most definitely not be invisible on your credit card bill. « Come for the Golf. Stay for North Korea. im not sure if anyone thought of this, but could birds die from that? we hear alot about birds flying into skyscrapers and dying from collision, would/does that happen here? Great question! We’ll see if we can track down the answer. It has an infrared coating that is visible to birds. I think it is fascinating how architecture has become so intertwined with travel today. As a form of art, architecture has become a way of attracting people to places which may have never had appeal beforehand. Although Sweden is a beautiful and often-traversed country in the travel industry, imagine the profit you could bring to otherwise desolate, economically impoverished areas if you create such unique landmarks such as this. I’m surprised to see how “modern-chic” the inside is for the tree-house, certainly it may be even larger than some apartments in NYC i could bet! Tree houses have really come a long way, not to mention invisible tree houses. The cost is quite steep, i wonder if this is more common for locals to splurge on or for international travelers who are searching for a thrill? All the photos are real (except for the cutaway of the interior layout). It’s a VERY cool place to stay and see for yourself next you are in Lapland. That looks seriously cool. Are the photo’s real or photoshopped?! I stayed in a treehouse in Laos last year. Not exactly luxurious though- we had to zip wire down from the tree in the middle of the night because there was a thunder storm! It looks pretty cool, although this is more appropriate for adults than kids.